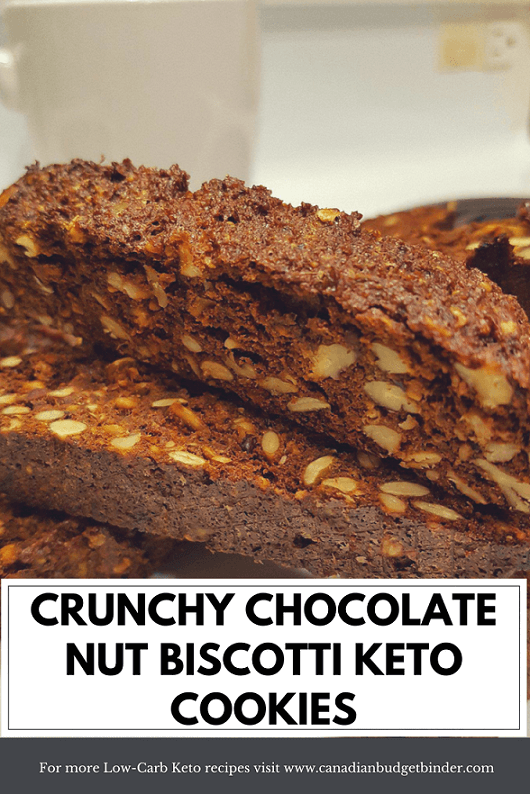 These Chocolate Nut Biscotti Keto Cookies are not necessarily for those in the induction stage of Keto or Atkins but as you start losing weight and want to add in a Low-carb snack once in a while this is a crunchy winner. If you’re just looking for a sweet snack without all the sugar this is the perfect cookie for you. With the holidays around the corner every low-carb foodie is thinking about baking cookies that they can serve to their guests and to snack on themselves. One of the biggest challenges for any holiday is to curb the over-indulgence in sweets and savoury foods that can easily add extra pounds if you’re not careful. Don’t leave home without thinking about your nutritional needs. Even for Keto, Low-carb lifestyle food lovers this challenge is just as real especially when there are no snacks or treats available at gatherings. Sure you could sneak in an Atkins or Kirkland Protein Bar but who wants to do that unless you know you struggle to control your sweet tooth urges. The last thing you want to do is step out of ketosis but if you do then back on you go the next day but the Keto-flu according to Mrs. CBB can be on the same level as quitting smoking and starting again, challenging but doable. I know you are thinking there is no such thing as delicious Keto cookies without sugar and lots of crunch but rejoice I’ve finally created one. Over the past few weeks every chance I could get in the kitchen I would test making various batches of Italian biscotti, chocolate chip cookies and peanut butter chocolate chip cookies using almond flour, coconut flour and even a mix of both. I knew Mrs. CBB was always complaining that any low carb snacks we’d make would always be soft and after a while they aren’t so appealing. Low-carb cookies made with almond flour almost always turn out soft and any keto diet fan can attest to craving the crunch. One of the most important things I did to the recipe was add the nuts which gave it extra crunch and held the biscotti together as you’d find in a traditional biscotti. Before I get into how many batches of cookies I ate I want to confirm that an almond flour cookie baked to smitherines will still be soft and possibly give off that burnt taste. Don’t waste your ingredients trying. There is a low and slow method to my madness. Our last resort but certainly not our last batch of Keto cookies began with almond flour but we added a mixture of crunchy nuts, Torani sugar-free caramel syrup and Swerve icing sugar. I made this batch of crunchy chocolate nut Keto cookies three times and it wasn’t until the last chocolate nut biscotti went into the oven that I hit gold. Biscotti cookies are always double-baked to get that traditional Italian crunch cookie which I knew. I’ve made Italian biscotti many times over the years but with flour so they take on a different baking strategy. The first batch we made turned out chewy. The second batch was over-baked and still soft. The third batch of crunchy chocolate nut biscotti Keto cookies turned out perfect. Well, as perfect as we could get them. The idea was finding the right temperature and time to get these Keto cookies crunchy enough so they would stay that way. Sometimes you’ll find a cookie comes out crunchy (over-cooked) and then gets soft. Not these chocolate nut biscotti Keto cookies. 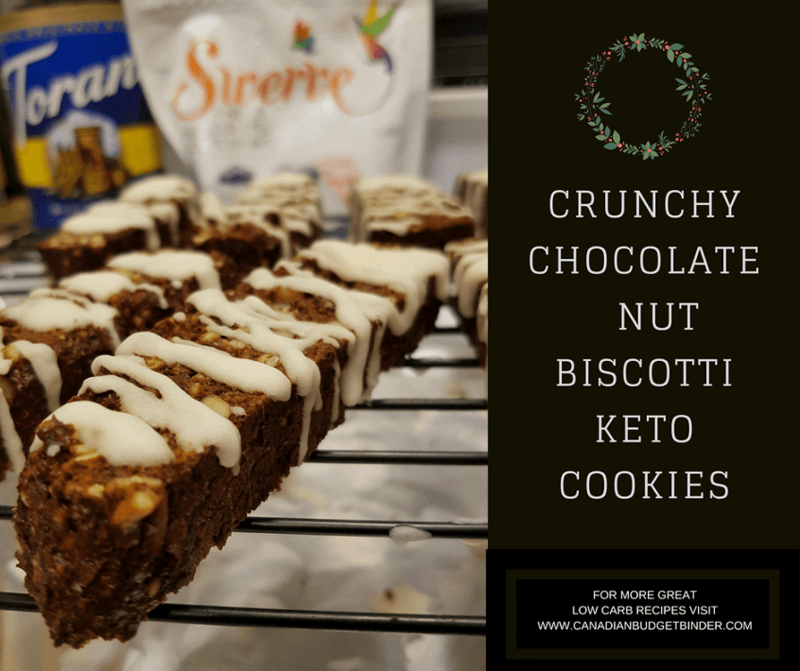 Although these chocolate nut biscotti Keto cookies are delicious on their own, dipped in hot coffee or cold milk I had to add a drizzle of sugar-free vanilla icing made with Swerve sugar-free icing and a bit of cream and water. Easy. One tip if you do choose to add the sugar-free icing is to wait until the next day to dress them up. 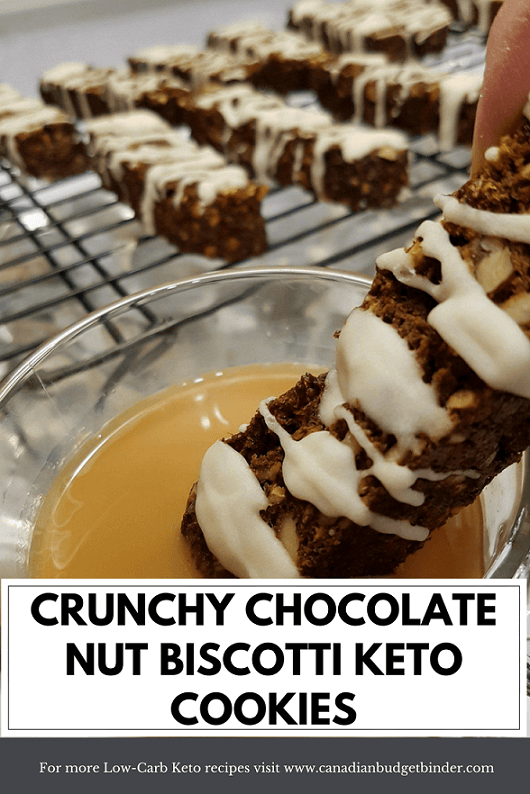 This gives your biscotti Keto cookies and opportunity to crunch up to the max. Although they are a bit time-consuming they are worth the effort and extra hydro costs compared to what you will pay to buy pre-made sugar-free cookies. If you don’t care to leave the biscotti for the 2 hours on low then feel free to find a crunch consistency that you fancy and take them out earlier if you wish. I find that letting them soak up light heat and staying over-night in the oven to yield the crunchiest biscotti keto cookies . Keto Cookies are finally here and they are crunchy Italian biscotti filled with nuts and chocolate cocoa. On a parchment paper lined baking sheet or silpat form the cookie dough into long oval shaped log about an inch high. Bake at 350 degrees for 20 minutes or until the cookie is firm on the top but leaves an indent meaning it is soft in the middle. Lay them flat on your parchment paper or silpat and return to the oven for 15 minutes at 350 degrees and then lower the temp to 225 degrees for 2 hours. Note: You will want to turn the biscotti half way through the baking process so they are evenly baked. Shut your oven off and leave in the oven over-night to crunch even more. Make the icing sugar drizzle the next day and decorate your biscotti. Let icing firm and serve. 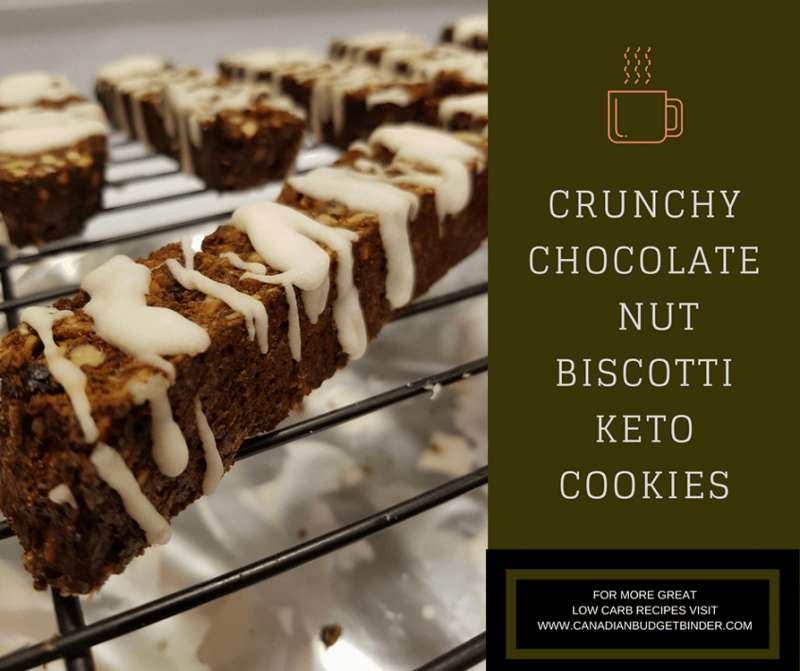 Once your crunchy chocolate nut biscotti Keto cookies are cooled you can freeze them for up to 6 months but they won’t last that long. Discussion: What other varieties of low-carb biscotti should I make for the blog?